February in Montreal is cold, but this famously frigid Canadian city has plenty to offer the brave souls who can see past the low mercury: Low season hotel and travel rates, ice-skating, and a massive arts festival are just some of the fun to be had. No matter what time of the year you visit, the charms of the city still aren't lost. You can head below ground to Montreal's Underground City, where you'll find shops, restaurants, and other entertainment below street level. The sprawling underground city stretches throughout downtown, making it easy to get around even when the weather's not cooperating. February is Montreal's second-coldest month, but the weather can be surprisingly fickle. You might find days with warm temperatures that feel like spring on one day and temperatures well below freezing on the next. When the weather person announces it is -15 degrees Celsius (5 degrees Fahrenheit), you know it is cold! This is the temperature where schools will possibly keep kids in for recess. Additionally, temperatures may feel colder because of Montreal's wind chill factor. In general, though, Montreal winters are cold but dry and sunny, with an overall average of -8 degrees Celsius (18 degrees Fahrenheit). Visitors can expect some snowfall and occasional rainfall during at least half the days in February. The city experiences an average of 4.5 hours of sunshine in February. Montreal has cold, snowy winters. The sub-zero temperatures feel colder because of the wind, but, temperatures are not necessarily unpleasant if you're prepared. It's all about having the right gear. Visitors to Montreal in February should be prepared for a variety of temperatures, but mostly really cold or downright freezing. Pack clothing that can be layered. Walking can be precarious, especially in Old Montreal where the streets are cobblestone, so proper nonslip boots are a must. Consider buying the slip-on Yaktrax that slip over footwear for increased traction. The cold weather isn't extreme enough to keep you in your hotel room, because Montreal has plenty of opportunities for fun in February. Montreal en Lumière is an all-night arts festival around the city. It typically runs from the last week of February into early March and includes concerts, cooking demonstrations, and food samples, and, naturally, an incredible light show. Fête des Neiges transforms Montreal's Parc Jean-Drapeau into a winter wonderland, complete with ice-sculpted playgrounds, snowshoeing, skating, a hockey tournament and more. Igloofest is billed as the coldest music festival in the world. Held at Montreal's Old Port, the festival spans two weeks and attracts thousands of electronic music fans to the city. Family Day is a popular celebration in many provinces in February, but is not observed in Quebec. 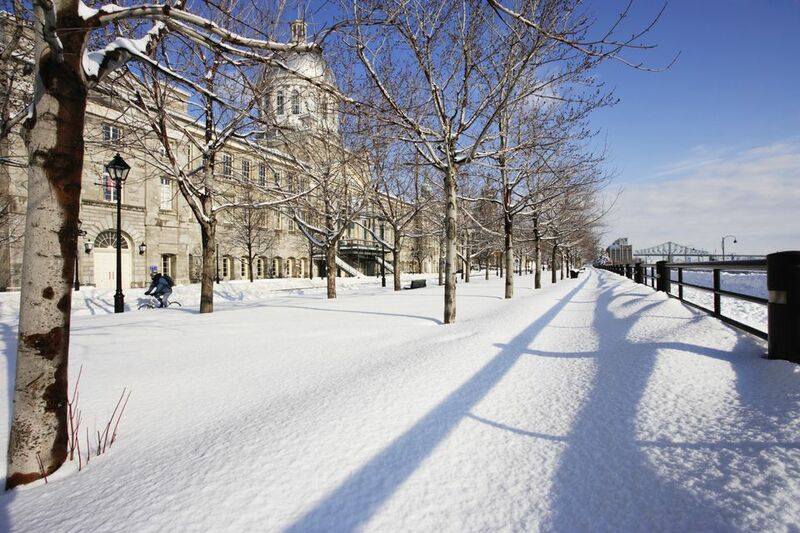 On a day with nice weather, have a skate—harbor-front skating in Montreal is free every day. If you're looking for a day- or weekend trip outside of the city, Quebec City, three hours east of Montreal, hosts its annual winter carnival, which goes until the second week of February. Driving in Montreal during the winter is challenging. The province of Quebec, in fact, mandates all cars have snow tires. If you can avoid driving, do so. Take the excellent public transportation system or cabs. Weather temperatures will often include a "wind chill factor," which means that it feels colder than what the thermometer actually reads because of a cold wind. An example of what you might hear a meteorologist say is, "It's minus six, or minus 10 with a wind chill." People in Montreal are a stylish bunch but they're not extreme about it. Come winter, locals wear appropriate footwear and clothing. Sidewalks can be extremely slippery and may not always get shoveled or have sand or salt added for grip. Wear boots or warm, weatherproof hikers. Utilize Montreal's Underground City in February, as it is a welcome escape from the cold. This network of underground paths connect major centers in downtown Montreal and include shops, restaurants, subway stations, hotel entrances and more.